This article is a two-parter. 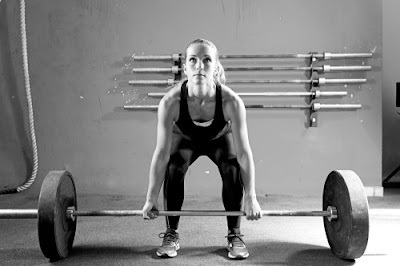 Part One is about how weightlifting is a good activity for building your self confidence. Part Two is about how to maintain self confidence through a variety of methods. In theory you could do both, but lets explain why both of these activities are good for boosting confidence. In the case of Weightlifting the boosts to your confidence are multi-faceted. You still get a release of Endorphins and Hormones while weightlifting, although not to the same degree as Runners High does. The result is that many people who get really into weightlifting will experience an Endorphin High. Note - It isn't a high like being drunk or stoned. It is more a rewarding feeling of euphoria. After exercising many weightlifters will report feeling "unstoppable" for approx. 45 to 60 minutes after their workout because they are "so pumped up". This is a combination of both the endorphins and the feeling that they are physically bigger immediately after a workout. As time goes by your strength and endurance increase, and mentally you feel more capable and more confident about your physical capabilities. Be careful you are not over-confident however, that leads to foolish accidents. It is true that many weightlifters like to admire themselves in the mirror. Some perhaps a bit too much, but they are doing so because they are liking the results they are seeing. The confidence is there, building. Sometimes it might be over-confidence, so try to focus on staying humble. Use your strength to help people during your daily life. Suddenly helping someone carry a baby carriage down a flight of stairs doesn't seem so difficult and you feel good about doing it. Feeling stronger in your daily life will boost your own sense of self worth. Tip #1. Be careful not to over-train. Over-training causes you to lose muscle mass and become weaker over time, because you are overdoing it. If you feel worn out, exhausted, completely out of energy after a workout then you might be over-training. A good way to prevent this is to take regular breaks, hydrate and to focus on a moderate amount of repetitions with a moderate amount of weight. Trying to do lots of repetitions and lift ridiculous amounts at the same time is just going to exhaust you, causing more harm than good. You will know you are over-training if you feel exhausted each time, and actually feel weaker as time progresses. Tip #2. Keep a journal of how many exercises/repetitions you do each workout and focus on leaving the gym feeling pumped up instead of leaving the gym feeling exhausted. Tip #3. If you are feeling ill, tired due to lack of sleep or less-than optimal on a particular day, try reducing the weight between 5 to 20 pounds and focus on building endurance instead of strength today. It is okay to have an off day. Tip #4. Once in awhile, like once per week or once every two weeks, you should try lifting a new personal record. Each time, even if it less than you were hoping, you should write down your new personal best in your journal. Tip #5. Eat healthy! This is perhaps the most important thing you can do. You cannot build a weightlifting machine by feeding the engine doughnuts and coffee filled with sugar and cream. #6. Maintain Proper Form and Posture. Form is more important than weight or number of repetitions. Bad form leads to sports injuries. Good form builds muscle faster. What did you do well? What would you like to change or improve? These questions are really geared towards making you a better weightlifter over time, but they also have the benefit of allowing you to evolve as a weightlifter and become better at it - and as a result it helps to maintain both your confidence and your motivation to keep lifting. There are other tips for staying focused and staying confident while exercising. These tips include things like: Giving yourself a sports day once/week where you can go enjoy a fun activity outside instead of staying cooped inside in the gym all the time; Give yourself something to think about while you are exercising, like a mental puzzle or a mystery - this keeps your brain active on a task while doing the physical activity. eg. I like working on ideas for future projects in my head (whether they be woodworking, writing, artistic or even poetry) while I am weightlifting; Lastly, listen to music. A few good songs that make you feel excited to exercise certainly help keep you focused and enjoying what you are doing. Need more help? Hire a personal trainer. Can you name someone over the age of 90 who is a heavy drinker or a frequent smoker? I know I cannot. Indeed when I stop to think of older people I know of who drank / smoked frequently, most of them died in their 50s, 60s and only a few made it to their 70s before kicking the bucket. 1. 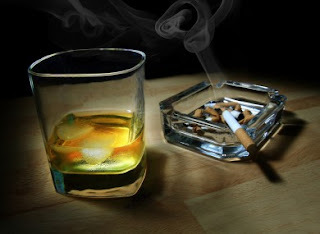 Smoking / drinking really reduces your life expectancy. 2. Peer pressure when people are younger really has a lasting effect on longevity, or lack thereof in this case. From my own past I can really only remember a few times when people even offered me a cigarette. One of those times was at a wedding reception and all the "cool people" close to my age were hanging out near the side exit at the back of the church, enjoying the cool night air and most of them were smoking. Several of them offered me a cigarette, because I was a teenager at the time and they must've thought that I smoked. I answered each offer however with the following line: "No thanks, I quit." I feel that was a brilliant lie, but a lie nevertheless. Truth is I had zero intentions of taking up smoking just so I could hang out with other people in my age group. However that doesn't mean that everyone in my family also believed in restraint. I had two uncles and one aunt who are no longer with is because they smoked and drank themselves to an early grave. Heavy smoking and hard liquor in all three cases. They lived long enough to see their grand-kids born, but not long enough to see those same grand-kids full grown. Two of my other relatives have since quit smoking and cut back on the drinking. The first because his mother and father had died from it and it scared him to think he would be next, so he quit. The second had a bit of a cancer scare / reality check and has since quit smoking / drinking. Notice something else? All the smokers in my family were also the heavy drinkers. For whatever reason those two things went hand in hand. While the rest of us, the remaining 90% of the family didn't smoke and rarely drank. And for those that embraced this life style of sobriety and healthy living? Well lets just say that they all live into their 90s, with only a few exceptions. At present I am 37 and my grandfather is still alive, and he is as robust as ever. I fully expect to live well into my 90s or die an early death from a mountain climbing accident (not a prediction, just a random possibility). Still I would rather die from a random accident or old age than an early death from something that is both preventable and problematic. Okay, so the title here is a bit misleading. There is no such thing as a ‘perfect pregnancy diet’. Every pregnancy is different, every mother has different nutritional needs in the first place, and every fetus will demand different things. However, there are a few rules of thumb which, if followed, can help you and your baby to get the very best start on your parenting journey! Here’s what and what not to consume while you’re expecting. Cereal – some fortified cereals contain 100% of your recommended daily folate intake. Multivitamins – But be sure that they’re made by a trusted supplier! Natural light – Vitamin D is most commonly absorbed through the skin in the form of sunlight. Thus you’re likely to absorb less Vitamin D in low light conditions (during the winter this sometimes leads to the "Winter Blues"), so it might be worth indulging in some of the following alternatives as well! Peanut butter – healthy and delicious! Lean red meat – lean beef is an excellent source of iron, but be careful not to be overenthusiastic with your red meat consumption! As we’ll explain in a moment, too much red meat during pregnancy can have unwanted side effects. Soft And Mould-Ripened Cheeses. Sorry, soft-cheese addicts. Brie, Camembert, Gorgonzola, Danish blue, Roquefort…they’re all out while you’re pregnant. Why? Because the delicious mould in these cheeses may contain a bacteria known as ‘Listeria’ which can cause miscarriage and stillbirth. No after-dinner indulgence is worth that. Hard cheeses aren’t so dangerous, as they have less bacteria-harboring water within them. If you really do love your soft cheeses, then it should be safe to eat them if you cook them first. Raw Eggs. Raw eggs, and foods containing raw eggs (mayonnaise for example) can pass on salmonella. This has the potential of seriously harming your baby. Avoid – it’s just not worth the risk! Pate. Even vegetable pates can contain the aforementioned listeria bacteria. With soft cheese and pate off the list, the list of things to smear on crackers during pregnancy is disappointingly short. It’s worth forgoing your spread-based indulgences for nine months, though, for the sake of a healthy baby. The prescription drug Isotretinoin, or Accutane. Oily Fish. Some types of oily fish such as shark, marlin, tuna and swordfish contain high levels of mercury, which can cause problems with your baby’s developing nervous system. 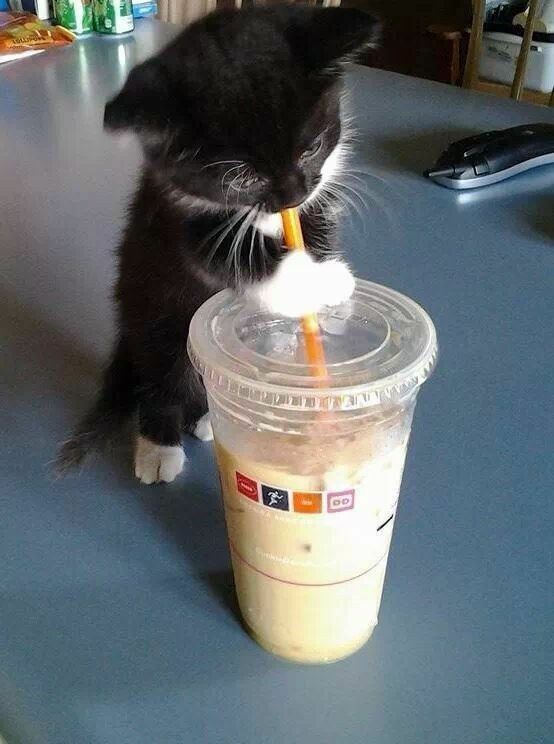 Caffeine. You don't have to cut out caffeine altogether, but do try to limit how much of it you consume. High maternal caffeine consumption has been linked to low birth weights, and a growing body of evidence is linking serious coffee habits with miscarriage in early pregnancy. Alcohol. We all know by now that drinking during pregnancy can damage your baby’s developing body, and leave them with serious deformities. The liver is one of the last organs to develop, so fetuses have no real way of processing alcohol. A baby exposed to too much alcohol in the womb may grow up with learning difficulties and cognitive abnormalities. It’s best all round to have a sober nine months. Look at the two runners on the right. Which of them looks more natural and healthy? If you picked #396, you are correct. He looks way healthier than #301, mostly due to his more muscular physique, better form, whereas #301 looks like he could collapse and die any second. 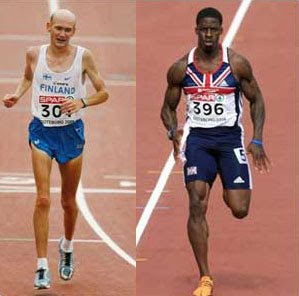 The differences between #301 and #396 isn't limited to their clear differences in muscle mass however, it is also a matter of differences in how they trained their bodies, how much nutrition they gave themselves while training, and whether they overdid it during the training process or whether they optimized their training / nutritional habits. There is also a difference in sport. #301 is a marathon runner, which requires endurance. #396 is a sprinter, which requires sudden bursts of sheer speed - which requires more muscle power. However being super skinny is not a necessity for being a marathon runner, rather it is a side effect of Exercise Addiction. Exercise Addiction is very common to marathon runners because there is a strong tendency to get "Runners High". While running very long distances your brain starts to produce a variety of hormones which act as painkillers to the runner, so that they can keep running. Unfortunately those natural hormones make for a very unnatural cocktail of chemicals, and behaves like heroin on the brain. 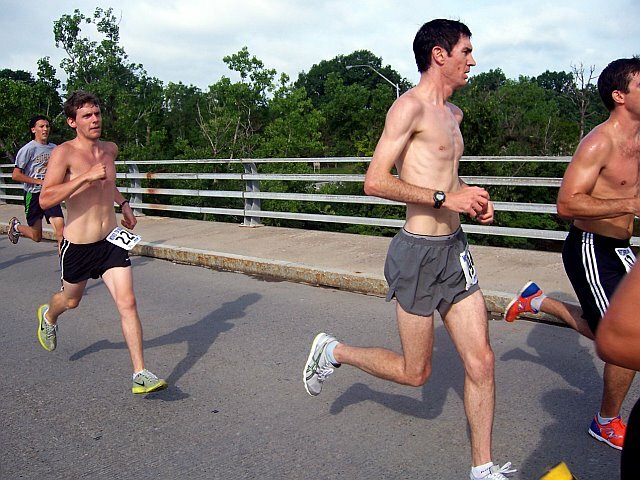 People get addicted to long distance running, they neglect their health in favour of going running, they aren't eating enough food to take care of themselves, and they end up becoming very skinny as their body starts cannibalizing their muscle mass as energy. Essentially what it comes down is that we should be encouraging people to take up sprinting more often, or hiking is also good, because jogging long distances clearly has its dangers. Exercise Addiction also comes with a host of other health problems, including possible anorexia (which is potentially deadly). An unhealthy increase in exercise levels. An unhealthy addiction to euphoric states, not just in the form of "Runners High", but the addict may also seek out other kinds of drugs to increase their addiction to euphoria. Social dysfunction as their addiction causes the addict to push away friends and family. Withdrawal symptoms include anxiety, restlessness, depression, guilt, tension, discomfort, loss of appetite, sleeplessness, and headaches. Exercising despite injuries and despite emotional trauma. Obsession with appearance and maintaining a skinny physique. May be combined with eating disorders. May lead to Obsessive Compulsive Disorder (OCD). Addict is dependent on exercise in order to feel happy and gains little or no happiness from social interactions. As a personal trainer I try to steer my clients here in Toronto away from anything that could cause them physical harm, whether it be sports injuries or a mental disorder. It is in the best interest of my clients that they have a healthy appreciation for exercise and not an obsession which causes them harm. I have written a number of other articles about exercise addiction, often with respect to marathon running. We know they are bad for us but many of us keep drinking them any way. My personal Achilles heel? Hot chocolate, either at home or from Tim Hortons. So lets start with that, since I too am guilty of that pleasure. 3 tablespoons of Nestle Carnation Hot Chocolate "Milk Chocolate" mix has 120 calories in it. This is the amount that is recommended on the label for making one cup of cocoa. Tim Hortons meanwhile has a calorie counter on their website... which is annoying slow and bothersome to use, but I managed to get it to work eventually. 1 medium Hot Chocolate at Tim Hortons contains 300 calories. Wow. The extra large, which is the size I normally get is 530 calories. Wow. 530 calories. That is almost the same amount of calories you would find in 5 cups of Rice Krispies (550 calories). Slightly more than the equivalent of 10 apples (520 calories). So yeah, that is a lot of calories for one measly drink. What about juice you say? Oh, you mean the sweet juice that has sugar added so it tastes amazing? Yup, that stuff is chock full of calories too. Even the supposedly health conscience fruit juices available have large amounts of calories. #1. Drink more water. Get into the habit of carrying a water bottle with you. #2. Drink more tea. Also something that you can store and carry with you. #3. Try vegetable juices. Healthier for you and comparably lower in calories. Takes some getting used to however. I recommend watching the documentary film "Fat, Sick and Nearly Dead" which is about a man from Australia who becomes a professional juicer and goes on a road trip across the USA to talk about health issues. Below is the extended trailer. Various websites online have the full documentary available. I have not checked recently, but it may also be available on Netflix. 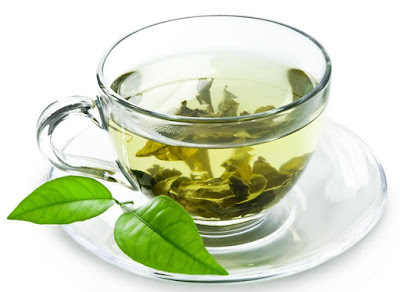 Yesterday I wrote a post title The Health Benefits of Green Tea, during which I mentioned there are also health benefits to drinking boiled water. So here we are, lets discuss this! Local drinking water isn't always the safest, which is why drinking tea is so popular in many ancient cultures where the drinking water was considered unsafe. 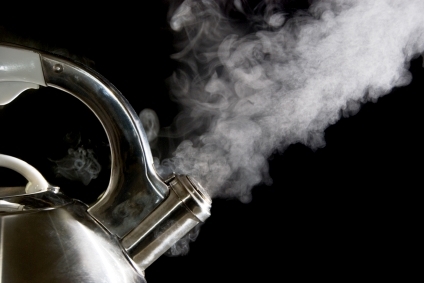 By boiling the water first, it kills 99.99% of the bacteria - making the water healthier to drink. The remaining 0.01% that may survive will be killed off by stomach acid or killed by your body's immune response. Drinking boiled water is great for maintaining a healthy metabolism, which is what you want if you’re trying to shed a few kilos. The best way to do this is to kick start your metabolism early in the morning with a glass of boiled water and lemon. As an added bonus, boiled water will help to break down the adipose tissue (aka body fat) in your body. Drinking boiled water is an excellent natural remedy for colds, coughs and a sore throat. It dissolves phlegm and also helps to remove it from your respiratory tract. As such, it can provide relief from a sore throat. It also helps in clearing nasal congestion. Hot water can also aid in diminishing menstrual cramps. The heat of boiled water has a calming and soothing effect on the abdominal muscles, which eventually can help to cure cramps and spasms. Hot water is fantastic for helping your body to detox. When you drink boiled water, your body temperature begins to rise, which results in sweat. You want this to happen because it helps to release toxins from your body and cleanse it properly. For optimal results, add a squeeze of lemon before drinking. There’s a reason you should want to clear your body of toxins: they make you age faster. Also, drinking boiled water helps to repair the skin cells that increase the elasticity of your skin and are affected by harmful free radicals. Subsequently, your damaged skin becomes smoother. The benefits for your skin just keep on coming. Boiled water deep cleanses your body and eliminates the root causes of acne-related infections beneath the skin. Drinking boiled water is also good for obtaining soft, shiny hair. It energizes the nerve endings in your hair roots and makes them active. This is beneficial for getting back the natural vitality of your hair and keeping it healthy. Drinking boiled water keeps your scalp hydrated and helps fight against dry scalp or dandruff. Another important benefit of drinking boiled water is that it enhances your blood circulation, which is important for proper muscle and nerve activity. In addition, it keeps your nervous system healthy by breaking down the fat deposits around it. Drinking boiled water is particularly beneficial for digestion. Studies have shown that drinking cold water during or after a meal can harden the oil present in the consumed foods. This can create a fat deposit on the inner wall of your intestine, which can eventually result in intestinal cancer. However, if you replace the glass of cold water with hot, you can avoid this problem. In addition, hot water is beneficial to digestion, which is what you want after a meal. Speaking of digestion, drinking boiled water can help to keep you regular, as well as make your bowel movements healthy and pain free. Dehydration can result in chronic problems with constipation. As the stool gets accumulated inside your intestine, the movement of the bowel becomes slower. It is always recommended that you consume a glassful of hot or warm water every morning when your stomach is empty. It decomposes any remnant foodstuffs and makes the movement of the particles smooth and less painful through the intestine. Okay, I admit I am adding this one because it is amusing / fascinating, but it could potentially be useful if Donald Trump becomes president. Haha! Ideally what you want is commercially available water purification tablets, but that won't separate everything. The most reliable way is to distill and purify the water by boiling it at 100 °C. When you boil water at exactly 100 °C in an effort to distill it, all of the water will boil and become steam, while contaminated impurities won't boil. 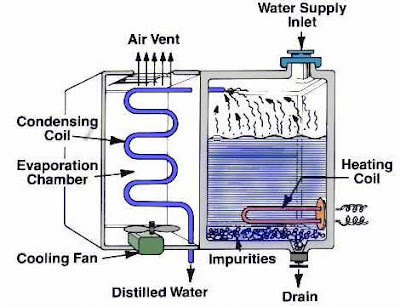 The steam is then collected in the still, condensed back into water either a cooling fan or cold water surrounding the tubes, and then drips back down into a container. A simple still can be constructed using plastic bottles, a tube and a heat source. The water doesn't actually need to be boiled in this case. It just has to be placed close enough to the heat source that the heat will slowly cause steam to rise up the tube and then fall into a 2nd container that is placed further away and insulated. The water should still be boiled to get rid of bacteria before drinking it however. 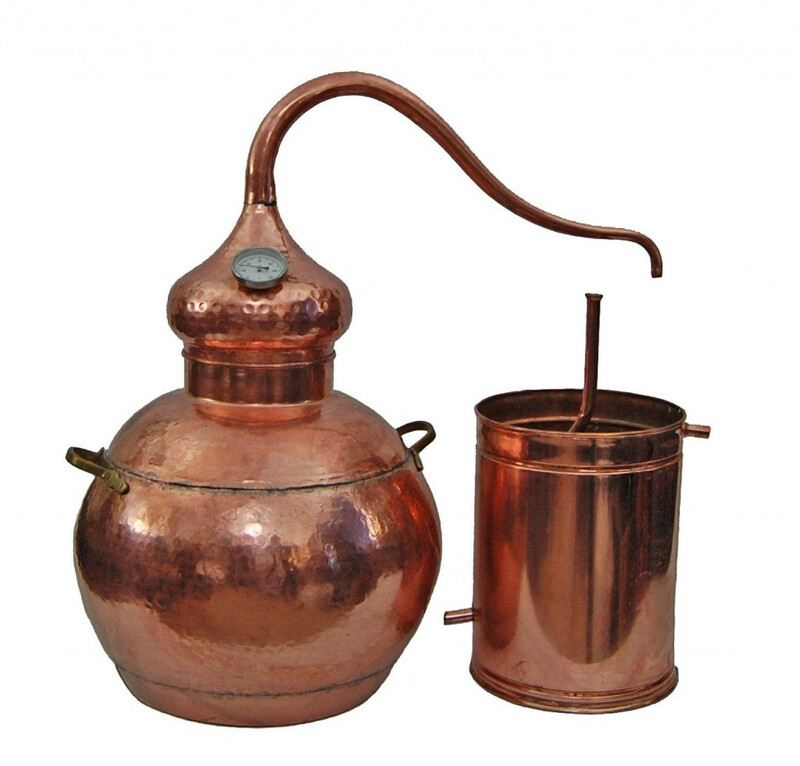 In a pinch someone could even use an old fashioned whiskey still, like the one pictured below. As a follow up to the above survival tip, boiling medical instruments in hot water is also an effective way of cleaning them. 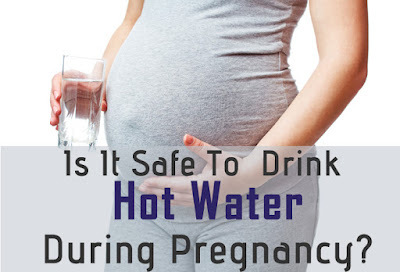 It is strongly recommended that pregnant women regularly drink boiled water. Consuming hot water (not scalding hot, just warm) keeps both mother and child hydrated, detoxified and energized. It reduces fatigue and infections while promoting healthier bowel movements, reduces the effects of morning sickness and heartburn. Green tea is one of those rare herbal products growing in consumer popularity mainly because scientific research has validated its health benefits. As a supplement it is being marketed towards prevention of cancer, although green tea has also been linked in research to benefits like preventing diabetes, hyperlipidemia, and other chronic diseases, along with no notable evidence of severe adverse risks even at fairly high dosages (1600 mg of green tea catechins or about 6 - 7 cups of tea per day), the impetus for consuming green tea and its healthful components is strong. Culturally, green tea has been around for many centuries and lauded for its health benefits. Whether it truly was a benefit and how much wasn't fully revealed until recent decades, when studies into the benefits of green tea made it possible to how much it truly benefits tea drinkers. The tea leaf industry dominates, but there has also been growth in green tea supplements (pills) for those people too lazy to remember to drink a cup or two of green tea per day. All this talk about green tea has made me thirsty. I am going to go put a kettle on. Alpine Punch Tea (rooibos, coconut, apple, cinnamon, ginger, cardamon, black pepper, rose blossoms, almonds). Blueberry Tea (blueberry, ginseng, gingko). Cinnamon Tea, two different kinds. English Breakfast Tea, two different kinds. Green Tea, three different kinds. Ginger Tea (ginger, stevia, black tea). Honeybush Tea (honeybush, safflowers, sunflower petals). Hot Cinnamon Spice Tea (black tea, cinnamon, cloves, orange peel). Korean Barley Tea or 보리차 (toasted barley). Korean Plum Tea or 매실차 (plum, sugar, honey). Korean Ssanghwa Tea or 쌍화차 (ssanghwa powder with crushed almonds). #1. I must really like tea. #2. I apparently really like cinnamon tea (this is true). #3. I really like Korean teas, likely due to my time spent living in South Korea. #4. I still have 3 different kinds of green tea, although I must admit it is not my favourite. And those are just the teas I was able to find in the cabinets on short notice. We might have other packages of tea hiding in tins hiding behind pancake mix or bags of rice in other cabinets. I could drink tea every day for a year and probably not run out. Anyway, lets get back to the topic of green tea. Polyphenols, the major active components of green tea, is what is responsible for some of green tea's health benefits, whether are consumed as a tea or as a pill. However that is not the only active ingredient within green tea, so consuming a pill containing polyphenol doesn't necessarily give you all of the health benefits. + Boiled Water*** - Boiled water oddly enough has a long list of health benefits all by itself, but that is another topic for another day. Green tea includes caffeine and caffeine-related stimulants, specific flavonols (which act as antioxidants), and the highly researched class of green tea catechins. Primary green tea catechins consist of epicatechin (EC), epicatechin gallate (ECG), epigallocatechin (EGC), and epigallocatechin gallate (EGCG). EGCG, the most potent in this group, is responsible for most of green tea’s antioxidant, anti-inflammatory, and anti-carcinogenic properties - which is why green tea is so handy against preventing cancer. So basically green tea has lots of vitamins in it, plus a host of anti-cancer ingredients, making it overall very useful for preventing cancer and promoting good health in general. The U.S. FDA cites 400 mg as the safe threshold for daily caffeine consumption. Above 400 mg, health risks include gastrointestinal upset, muscle tremors, and palpitations. But to drink that much caffeine from green tea, you would need to drink the equivalent of 10 cups of coffee, or approx. 12 cups of green tea per day. Tea leaves also tend to accumulate aluminum from soil, and chronic high aluminum exposure (more than 20 mg per day for a 150 lb. person) has been found to cause Alzheimer’s disease. However that is basically impossible to consume, as that would require drinking approx. 800 to 1200 cups of green tea per day. It should also be noted that many foods contain aluminum and that small doses of aluminum (approx. 0.1 mg per day) do have health benefits (increases immune response), whereas high doses (20 mg or more) of aluminum have health risks. So basically the health risks of green tea are practically non existent, and could only result if someone was consuming ridiculous amounts every day beyond the normal amount. First the good news. Victoria, my cat, has lost weight. She is no longer overweight and looks healthier now due to a variety of factors. She is not a "skinny cat", and she is somewhat lazy, but she now gets a lot more exercise and is eating healthier catfood than she was before. Part One - "Our Cat is Fat"
Part Two - "Kitty is on a new Diet"
Part Three - "Cat Walking"
Part Four - "Conquering Failures"
Part Five - "The Scaredy Cat"
Part Six - "The Bouncy Mousey"
Next the bad news. I still have not managed to get her to go outside in the hallway for any extended period. She immediately dashes back into her home and begins clawing at the door and frantically trying to get back inside. I have not given up on my dream of catwalking Victoria however. Rather I have adopted a more patient approach. I will EVENTUALLY get her to go catwalking, but it will take some serious time and effort. Lastly, more bad news. This is the last post on this topic. I will be doing no further Pet Project posts in the future. If I have any further changes to Victoria's health status in the future I will be listing it below under Updates. It has a been a fun adventure getting our cat to lose weight and she is now healthier, more vibrant, less aggressive, more active (especially with the Bouncy Mousey in the middle of the night while we are trying to sleep), and she seems more graceful than she did months earlier. So the Pet Project was successful and the cat seems happier for it. 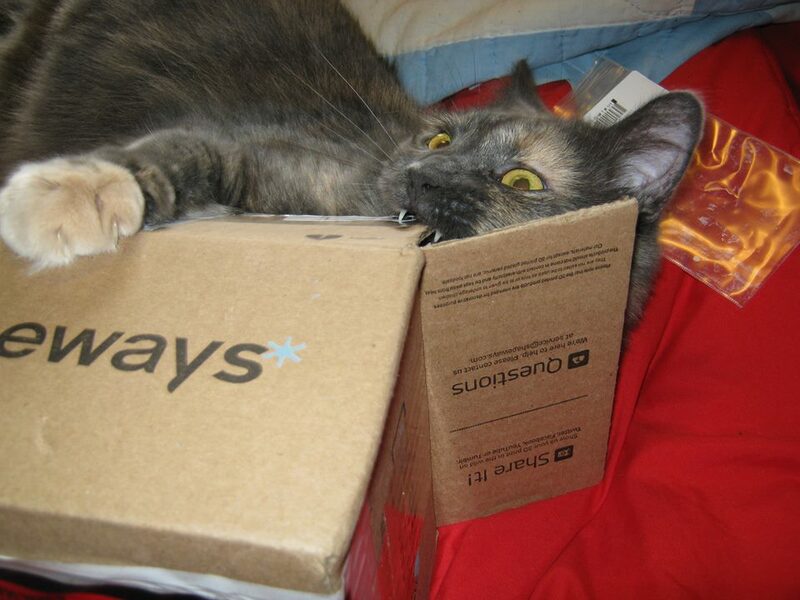 (Hard to tell, she is still a little aggressive.) You can see Victoria's YouTube channel at Victoria has Claws. Which are two intense cardiovascular sports, both requiring a level of dexterity and accuracy. 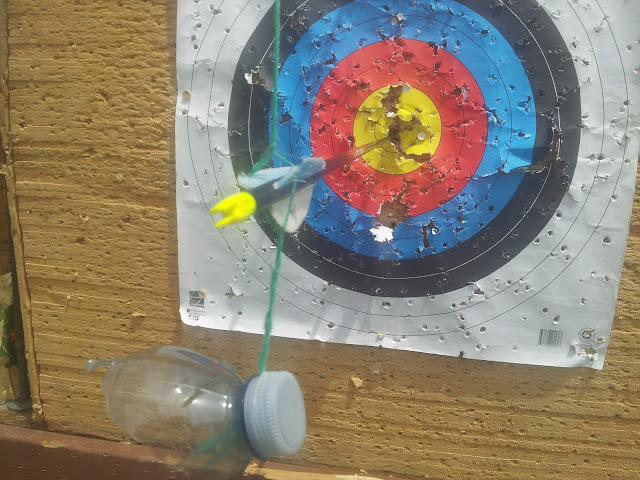 I thus conducted a fun experiment during which I practiced punching at the string, with an eye towards accuracy - after all, what good is a punch if it completely misses the target? For the 2nd part of my experiment I decided to get my tennis racquet out of the closet and try batting the mouse on the end of the string back and forth, letting gravity and pendulum motion to bring it back towards me each time. This turned out to be an excellent exercise for practicing my back swing and also switching back and forth. With a few changes it would be pretty easy for someone to practice with a tennis ball on a string indoors with a similar set up. Add a pole in the middle and you have a sport similar to tetherball. Inventing your own sports / exercises can be a lot of fun, whether you do them for a specific purpose such as training for a sport, or whether you are simply looking for a frugal exercise you can do at home. #1. Avoid anything where you think there is a chance you might injure yourself. #2. Use objects that are sturdy and can withstand impacts if dropped. Avoid anything you know to be breakable. #3. Don't do the same motion all the time with your new exercise. Find ways to change it, spice it up. Repetitive motion can lead to a sports injury. Not all pain equals gain, sometimes pain means you broke something or are repeating the same motion too much. #4. Try to invent exercises which are fun to do, or can be combined with music or other exercises to make it more fun. #5. Hydrate. 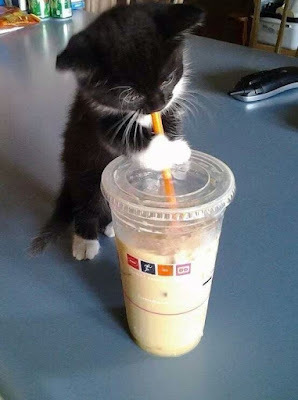 Don't forget to drink something regularly. Many people forget to do this. The photos on the right are of Chicago resident Andy Boyle, shown before and after he quit drinking. The left side is after he quit drinking, at 230 lbs. The right side is before he quit drinking, at 306 lbs. His weight loss happened over the course of two years after he stopped drinking and started making some healthy changes in his life. Wrote a book and multiple movie scripts. Performed in multiple comedy festivals. Went from a size 42 waist to a size 36 waist. 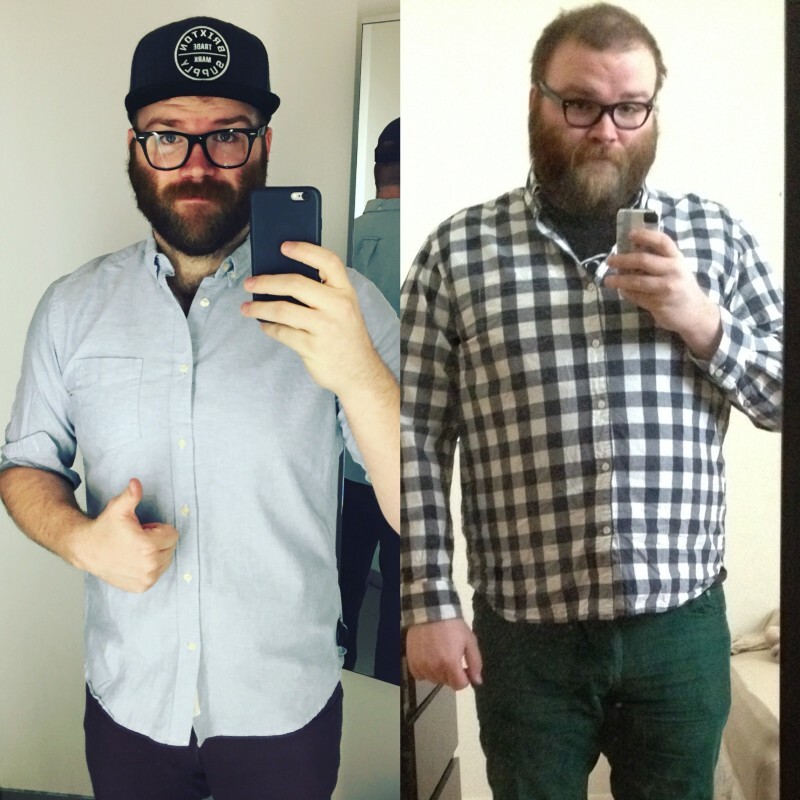 Discovered it really was more fun to be a healthier weight. Felt more motivated and productive. And frankly, Andy is on to something here. But we need a word to describe this phenomenon. I am going to call it "Pro-Drunkism". It is like Racism and Sexism, but it is basically describing a biased sentiment in favour of getting drunk and a bias against people who don't like getting drunk. Now speaking for myself, I must admit I enjoy drinking a beer regularly. At least once per week. I know it is unhealthy for me, but I figure I exercise so much that is evens out fairly well. Still it does make me wonder what would happen if I switched to red wine instead. Here is my reasoning. It is widely known that drinking 1 or 2 glasses of red wine per day has health benefits. Now I don't see myself drinking that much or that often, but it does get me thinking about the amount of calories found in beer vs wine. eg. 100 grams of beer has 43 calories [according to Google]. That is 154 calories for 1 can of beer (356 grams). Two beers would be 308 calories. Wine in comparison has 85 calories per 100 grams. Or 125 calories per glass (147 grams). Thus 1 to 2 glasses of red wine per day would be 125 to 250 calories per day. That is still less than the 154 to 308 calories for 1 to 2 cans of beer per day. It is a small difference, but still lets do the math. WINE: 250 calories x 364 days = 91,000 calories - - - - divided by 3500 = 26 lbs of fat. BEER: 308 calories x 364 days = 112,112 calories - - - - divided by 3500 = 32.032 lbs of fat. WATER: 0 calories x 364 days = 0 calories - - - - divided by 3500 = 0 lbs of fat. So yes, wine, purely on a calories basis is healthier in theory - unless you guzzle it like you do beer, in which case that would be really unhealthy. 62.94 lbs worth in a year if someone guzzled wine in the same volume like they do beer. Which admittedly could explain most of Andy Boyle's weight loss success. Now I am not saying that Andy was drinking two beer per day. Not saying that at all. Some of his health changes obviously came from his changes in diet and exercise as well. But it really goes to show people that if you make healthy choices you can really change your life around. So if you are looking for a New Years Resolution for 2016, how about "switching to water [or wine] instead of beer"? #4. Spend More Time Outdoors. #5. Spend More Time with Family. #6. Get an Energetic Dog and go Dog Walking Regularly. #7. Try a New Sport and Stick With It. For more ideas check out our past New Years Resolutions on CardioTrek.ca.